Please contact us, or call us at 866.480.7555, if you need additional information on these products. CALCOT is a co-op of family farmers in California, Arizona, and New Mexico who have banded together to bring their home grown 100% Supima Cotton to the US marketplace. All of our Calcot towels are manufactured in Pakistan to the high standards maintained by these proud U.S. cotton growers, using only 100% U.S. Grown Cotton. Calcot Supima cotton towels are a traditional RingSpun towel of Zero-twist technology, that is soft, fast drying & extremely durable. The use of Supima Cotton in a towel creates one which retains its softness & absorbency washing after washing. Each bath towel has a hang tag, thanking the purchaser for supporting the farm that grew the cotton. Features of our soft, extraordinary absorbent Supima cotton towels. Takes less time to dry, as your dryer works more efficiently. Reducing our Carbon footprint. Supima – grown in the Southwest region of the USA. Cotton fiber has a long staple, making it durable as well as soft. Egyptian – grown in Egypt. Cotton very similar to Supima. Ringspun – grown in the Carolina region of the USA. This cotton, at one time, was the most popular for towels. This fiber is very strong and absorbent, but not quite as soft as Supima cotton. All of these cottons are strong and absorbent, in general very good. Just the Supima and Egyptian are a little softer, but more expensive. 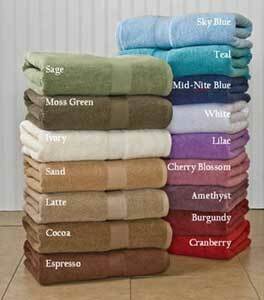 We offer towels in each of these types of cotton. Need more information, contact us. Our knowledgeable sales staff can answer all questions you may have regarding towels.